For our current and new client tech support, we use FogBugz bug tracking tool to track bugs, fix them, and add new features. With Fogbugz, you can directly send your bugs to our developers. This allows you to be an integral part of the bug testing and tracking process, and most importantly, getting those bugs fixed! 2. 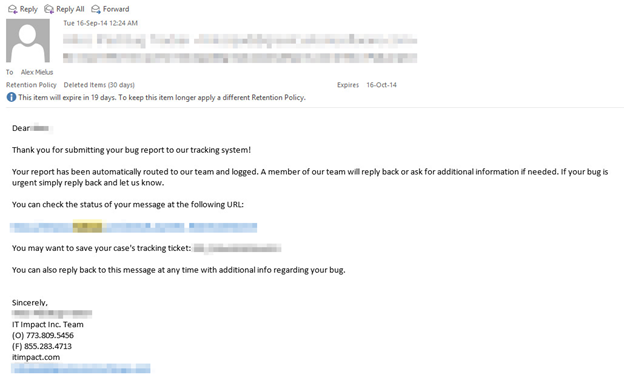 Email your bug from your custom email address that we will provide for you. If you explain your issue and open a case via email, you will receive a confirmation email and a case tracking number to view its status. Our developers will contact you directly before proceeding if they have a question or comment about your case. 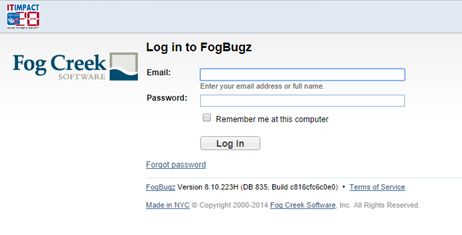 Log in: Fogbugz (An email will be sent to you when we create your account, and you will set your own password). Click on New Case at the top right, and fill out the form. Your case will be sent to a developer who will resolve it. You will receive correspondence from the developer if he/she has any questions or comments. In addition, you will be informed once the case is resolved and closed. When you log in to FogBugz, you can also see your Case Status. Active – Still not scheduled or not being worked on. Scheduled for Work and In Process – You’ll see these two statuses most often, either the bug is being resolved or it is scheduled to be worked on. Pending IT Impact Testing – When a developer fixes the bug he/she will either schedule internal testing or send it to Client Testing. Do NOT leave the bug In Process if you’ve already completed your own testing. You are testing, right? 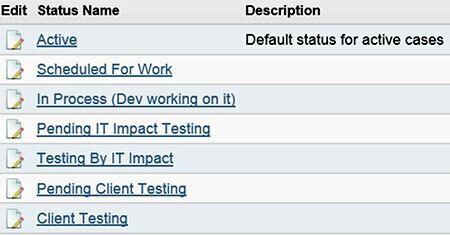 Testing by IT Impact – The tester will change it to this status while testing. Pending Client Testing – When the tester or developer has completed the testing, it is the client’s turn to make sure things are running smoothly. Client Testing – When the client has confirmed that they are testing.